a British statistician and computer pioneer. During World War II, Good worked with Alan Turing and Conel Hugh O'Donel Alexander at Bletchley Park, with Donald Michie and Shaun Wylie et al. in the section Newmanry headed by Max Newman, contributing to crack the German Lorenz cipher  . After the war he worked at the University of Manchester and Atlas Computer Laboratory, and had a variety of defense, consulting and academic positions, until he came to the United States in 1967, becoming a University Distinguished Professor at Virginia Tech. In 1965 he originated the concept of an intelligence explosion, now known as technological singularity , which anticipates the eventual advent of superhuman intelligence . Jack Good died on April 5, 2009, aged 92 . Jack Good was a strong chess player, and he published several papers related to computer chess in Michie's Machine Intelligence series , most notably his Five-Year Plan for Automatic Chess in 1968 , excerpts reprinted in David Levy's Computer Chess Compendium, covering Material, Quiescence, Turbulence, and Agitation . Theorem-proving resembles chess Playing in that we have an objective and an analysis tree, or graph, but differs in that a superficial expected pay-off replaces the iterated minimax. The minimax idea can come in if we are trying to prove a theorem and we imagine that we have an opponent who wishes to disprove it. The value of our game is 1 if the theorem is true and — 1 if it is false. In the proof trees described in the paper by Dr D. C. Cooper  the 'and's correspond to moves of the opponent, since we must allow for both branches, whereas the `or's correspond to our own moves. The minimax (strictly maximin) value of the tree tells us whether the theorem is true, and, if we allow for superficial probabilities at the endpoints of the tree, the minimax value is the superficial probability of the theorem. In letters to Turing, on September 16 and October 3, 1948, I mentioned the idea of resonance circuits in the brain; especially as a method for noticing analogies... In the postscript I discussed chess-playing machines, which he and I had discussed in 1941, and gave a reasonable definition of a forced variation. I took for granted the need to distinguish between quiescent and non-quiescent positions. Shannon's paper on chess appeared in 1950. In a letter to F C Williams in July 1951 I said "A facetious question is whether it is intended to display chess positions on the monitoring tubes". Of course today it is no longer at all facetious. Perhaps non-linear evaluation functions will become popular at some future date, in which case some of Good's ideas will come into their own. To statisticians, Good is one of the founding fathers of Bayesian statistics, an approach to the discipline based on work of Thomas Bayes in 1764. In it one forms a view of the phenomenon under study, quantifying one's uncertainty in terms of a probability distribution (the prior distribution). One then draws a sample, obtaining data, and uses the data and Bayes's theorem to update this prior uncertainty to give a new distribution, the posterior distribution. This approach - the Bayesian paradigm, as it is now called - was little used before Good's work but was given an important boost by his 1950 book and his extensive subsequent writings, and is firmly established today. 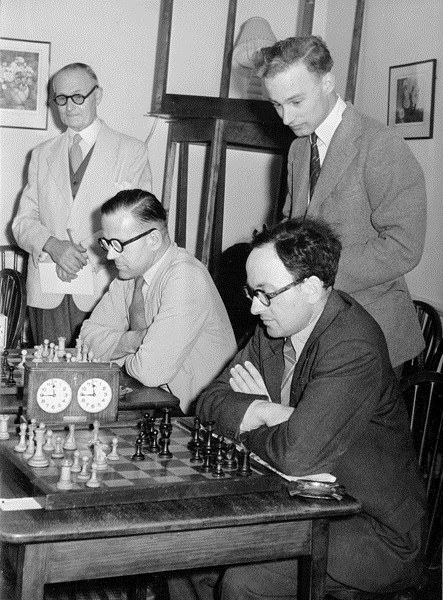 Good's other interests included artificial intelligence - in particular, training computers to play chess and philosophy. Jack Good (1978). Historical Notes. Personal Computing, Vol. 2, No. 10, pp. 80, October 1978, from Jack Good (1968). A Five-Year Plan for Automatic Chess. Jack Good (1978). Historical Notes. Personal Computing, Vol. 2, No. 11, pp. 27, November 1978, cont. Jack Good (1982). When will the rules of chess be changed? British Chess Magazine 102, No. 7 (July 1982), 305-306. Irving John (Jack) Good from PEOPLE and PIONEERS © J.A.N. Lee, 1998-2002. ↑ David Levy (1988). Computer Chess Compendium - 3.2 A Five-Year Plan for Automatic Chess (excerpt).